Muffin tops, love handles or fat flanks – no matter what you call this bulge along your back and sides – it causes great distress for both men and women. The only good news is that the stores of fat along your back do not cause the same toxic health concerns as fat accumulation around your belly. Having said that, carrying excess fat anywhere on your body harms your health. ‘Love handles’ best describes the malady felt by men whereas women most often describe the extra fat along the sides of the torso as ‘muffin tops.’ Both conditions are caused by fat deposits over the obliques, a group of abdominal muscles located on the sides of your waist. This pinchable fat sitting right above your waistband makes you self-conscious both in and out of your clothes. You’ve been here before – imagine. You put on that new pair of skinny jeans, look in the mirror and admire the way those jeans frame your legs and flatter your backside. But you’re not loving the look. Why? Because your jeans fit perfectly except for that annoying flab spilling over the waistband of your jeans. Ugh! Why do we develop fat in our lower back (flanks) aka ‘love handles’ or ‘muffin tops?’ First, remember that we wouldn’t develop excess fat anywhere without consuming more calories than our bodies require for energy. So weight gain or being overweight can lead to love handles. Second, heredity plays a role in where your body places the extra fat. Third, inactivity or not getting enough exercise goes hand in hand with extra weight and therefore in the development of excess lower back fat. 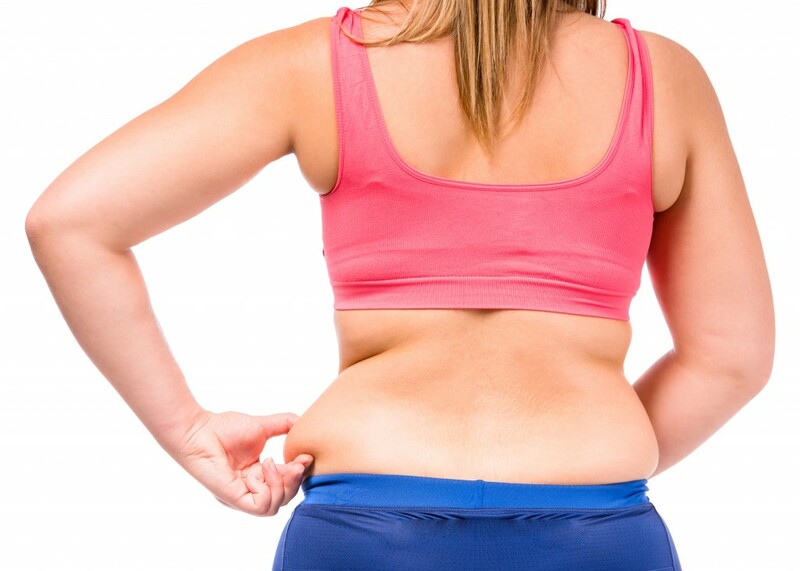 Losing the excess weight may or may not take care of you concern with your muffin top. Increasing your daily exercise may help take off extra fat but we know that spot reducing is not possible with exercise. We cannot forget our nemesis, the aging process. Because our muscle mass decreases and our metabolism slows as we get older, maintaining our weight becomes increasingly difficult. Excess fat may be deposited onto our lower backs. While we may not have a problem with a muffin top or love handles when we are younger, we often do as we get older. Finally, hormones may play a role in the development of a muffin top or love handles. The stress hormone cortisol causes all kinds of trouble. When cortisol levels rise, blood sugar is converted to fat for long-term storage. Estrogen is quite troublesome in the fat department. If your estrogen levels are normal, it helps to keep you lean. If your estrogen levels are off balance in either way, it turns you into a weight gaining machine. Many menopausal women are affected by altered estrogen levels. Moreover, the toxins we are exposed to in our environment (& in our foods) can lead to altered (lowered) testosterone levels. Healthy levels of testosterone contribute to the development of lean muscle mass. Lower testosterone levels lead to weight gain. Intervention with medical care, supplements and treatments may become necessary. You’ve learned the downside about lower back fat. Next, we will take a look at the upside – which is that we can do something about it. Look for our Part 5B wherein we discuss ways to tackle the ‘muffin tops’ and ‘love handles’ and look and feel great.